One of my first action items when moving to St. Louis in 1995 was to take a tour of the Anhueser-Busch Brewery. Fresh out of college, I thought the place that made Budweiser must be the only significant brewery in the history of the city. I marveled at the bottling machines, admired the Clydesdales, and tried to scam more than the allotted two glasses of free beer in the tasting room. Back then, I had no idea that there was much more to learn about the story of beer in St. Louis. As I've matured (well, maybe I should say “aged”), I'm pleased to report my appreciation for the history (and drinking) of beer in St. Louis now goes far beyond Bud and Bud Light. The history of beer in St. Louis is an enormous topic. It's too big for a single blog post, but to make this one work, a bit of historical backfill is necessary. In second half of the 19th century, the population of St. Louis exploded. Between the years 1850 and 1870, the number of people living in the city more than tripled. A significant part of that population growth was German. In 1829, a famous German writer dubbed Missouri “The Rhineland of the west”. As a result, thousands of German immigrants flooded St. Louis and the lower Missouri River valley. With the Germans came beer and the need to make more of it. St. Louis was a perfect fit for this industry. Along with a growing number of thirsty people, a large system of natural caves existed beneath the city. These caves provided the cooler temperatures needed to ferment large quantities of lager. As a result, St. Louis would find itself brimming with dozens of breweries in the latter half of the 19th century. I recently learned about the unique story of one of those breweries. Even better, I found my first opportunity to research the history and drink aspects of a subject at the same location. That brewery is Joseph Schnaider's Chouteau Avenue Brewery. Once located at the intersection of Chouteau Avenue and Twenty-First Street, it was one of the most successful St. Louis breweries in the in the 1870's. In 1876, Chouteau Avenue Brewery ranked among the top three local breweries in capital stock, annual value of business, number of barrels produced, number of employees on hand, and number of horse wagons used. Today, no trace of the brewery exists except for one building. It's founder, Joseph Maximillian Schnaider, was born in Zell am Hammersbach, Germany in 1832. A brewer by trade, he settled in St. Louis in 1854. At first, he co-owned a successful brewery named the “The Green Tree Brewery”. In 1865, he sold his interest to his partner and set off on his own. Shortly after, he opened Chouteau Avenue Brewery just west of the city. The story of Schnaider's brewery isn't much different from the other St. Louis breweries of the day. What makes it unique is the beer garden he built next to it. Covering several acres, Schnaider's Beer Garden served food and drink to thousands of people at once. At its height, it became a nationally known resort where visitors could enjoy music, watch theater, and of course, drink beer. The northern half of the brewery complex can be viewed in the upper left corner of plate 40 in Compton & Dry's Pictorial St. Louis. By lining up plates 39 and 40, the full extent of the beer garden can be seen. The main brewery is located in the upper-right edge of the complex (labelled “1”). The rest of the property contained an auditorium, pavilions, plenty of shade trees, gazebos, and other structures used to entertain the large crowds that would pack Schnaider's each day. Across the street from the brewery is a structure that no longer stands. It was demolished and Schnaider's Malt House was built there in 1876 (one year after the publication of Compton & Dry's Pictorial St. Louis). Schnaider's Beer Garden became a nationally known venue. Bands, theater groups, and travelling shows performed nightly during the summer months. According to the book St. Louis Brews: 200 Years of Brewing in St. Louis, 1809-2009, Schnaider even created his own light opera company to compete with a local baseball team, the St. Louis Brown Stockings. The success of the Brown Stockings (later to be known as the Cardinals) was drawing patrons away from his beer garden and eroding his profits. It's also believed that some of the musical groups that played Schnaider's would eventually combine to form the St. Louis Symphony Orchestra. To promote Schnaider's, schedules, advertisements, and reviews for performances such as “The Pirates of Penzance” and “The Beggar Student”, were published daily in local newspapers. Behind all the entertainment, Schnaider's served beer… enormous quantities of beer. Thousands of people would fill Schnaider's Beer Garden each day to eat, drink beer, and celebrate. They'd make toasts, smoke cigars, and watch fireworks displays as music and theater swirled around them. With such revelry, it's not surprising things would sometimes get a little out of hand. One notable example was reported by the St. Louis Post-Dispatch in August, 1881. A young man “under the influence of liquor” visited Schnaider's Garden and promptly began throwing tables and chairs around. When waiters intervened and called the police, the man simply claimed “Oh, that's nothing! We do that kind of thing in Philadelphia and never think anything about it”. The next morning, he found out things work a bit differently in St. Louis. A judge fined him ten dollars. Joseph Schnaider died in 1881 while visiting his homeland. His wife and oldest son took control of the brewery and continued to expand operations. Over the next ten years, several buildings were added to the complex, including an ice house, a machine house, a storage house, a bottling house, and a summer theater. By 1885, Schnaider's would be one of the largest breweries in St. Louis. Despite growth and the splendid reputation of garden, Schnaider's wouldn't last long. In 1889, eighteen St. Louis breweries were consolidated under one company, the St. Louis Brewing Association. Although breweries such as Lemp and Anhueser-Busch opted not to join the syndicate, Schnaider's Brewery did. Over the next few years, the SLBA began consolidating and closing down member breweries one by one. Schnaider's continued operations for a few years, but the beer garden slowly began to lose its allure. New musical venues and entertainment establishments opened around the city, drawing patrons away. In 1893, the brewery was closed and the beer garden abandoned. The main brewery buildings were converted to a cold storage and ice plant. The beer garden structures were razed to make way for a large shoe factory. The Schnaider Malt House, located across the street, is the only building that still stands today. Today, the “Centennial Malt House” (as it is now called) stands at 2017 Chouteau Avenue. In 2005, the building was purchased by Wendy and Paul Hamilton. They quickly went to work on an impressive $4 million restoration project. Across the street, the former site of the beer garden is now where several attractive row houses stand. These homes, located at the northern end of the Lafayette Square neighborhood, set a good example for effective urban development in St. Louis. Schnaider's Malt House is significant because it is was one of the first malt houses to be constructed in St. Louis. Designed by Fred W. Wolf, a Chicago engineer, and Louis Kledus, a St. Louis architect. Wolf was a prominent brewery engineer of the time. The Schnaider Malt House is one of his earliest designs and one of just a handful that still stand today. Today, the building is on the National Register of Historic Places. The Centennial Malt House offers a variety of dining and drink options. The first floor contains PW Pizza, a great place to drink local beer and eat pizza made with fresh ingredients. Moulin, on the second floor, can be rented for special events and meetings. The third floor contains the rooftop bar and bistro, Vin de Set. There's also a small market and culinary store on the first floor named Grand Petite Market. The Malt House Cellar, which once granted access to the underground caves, is also used for private events. Overall, it is an impressive renovation of a historic building. After thinking and writing about Joseph Schnaider and his brewery for over a week, I'm elated that I can get a drink in the actual building that I'm writing about. It's a first for this blog. Even better, Vin de Set is exactly the kind of place where I like to get a drink. Although it has a nice rooftop seating area, the bar inside is even better. The lighting is great, the staff is extremely friendly, and the brick and woodwork make for a great atmosphere. It's obvious the history of the building was important to the designers. The first thing a visitor sees when entering the bar is a familiar statue. It's a smaller version of “Apotheosis of St. Louis”. The full-size version of this statue is a symbol of St. Louis city and stands in front of the St. Louis Art Museum. While at Vin de Set, I was told this smaller version was presented to Schnaider's as a gift to commemorate the 1904 World's Fair. Years later, it was found stored away in the Malt House missing its head and sword. It has since been restored and now sits impressively above the bar. My drink of choice at Vin de Set was an Old-Fashioned cocktail. Made with a spirit, bitters, simple syrup, muddled fruit (and sometimes club soda or water), the Old-Fashioned is one of my favorites. I plan to write more about the history of this drink in its own post . I've been told it's considered an “old man drink”, so it's appropriate that I'm in an old building (but at 41, not yet an “old man”). Even better, the bartender made a good one. He made it with rye whiskey, which I was happy about since I did not offer any instruction. Some Old-Fashioned drinkers eschew the fruit, but like the history of the drink, I'll save that argument for a future post. For now, I'm happy to have rye whiskey in my Old-Fashioned. Since Vin de Set also offers a full menu, I'm sure I'll be heading back to take in a bit more of the Schnaider ambiance. Notes: The original idea for this post came from Andy Hahn, the Director of the Campbell House Museum. One day he mentioned a “beer garden that could hold thousands”, and it caused my eyes to light up. Much of the information for this post was obtained courtesy of Landmarks Association of St. Louis. The renovation of the Joseph Schnaider Malt House was on their list of “Eleven Most Enhanced Places” in 2006. Photographs are courtesy of the Missouri History Museum. 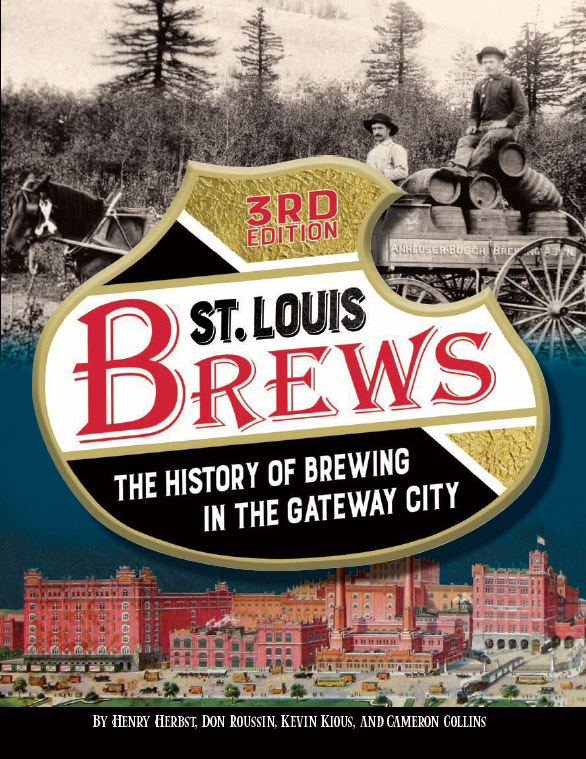 The book St. Louis Brews: 200 Years of Brewing in St. Louis, 1809-2009 by Henry Herbst, Don Roussin, and Kevin Kious also provided quite a bit of information. Anyone who is interested in the history of beer in St. Louis should own that book. Great story. I wonder if the brewer’s alliance inhibited the business management ability of Schnaider’s and other local breweries. It’d be awfully nice to still have a place like that holding down our near south side, but as you said — from it, we now have Vin de Set. Not too shabby. And you’re right — there’s some smart and efficient in-fill around there from those row houses. Maybe a bit too many of them in the same style, but it definitely doesn’t stick out sorely against some of the older homes around it. Thanks for the comment. I agree. I like the row houses, but there are quite a few of them. According to Landmarks, the SLBA merged many of smaller the breweries to meet the competition of other larger independent breweries (I’m assuming A-B & Lemp, particularly). None of the SLBA breweries made it through Prohibition. Another wonderful post. I have been to Vin de Set and the party space below it many times and had not realized the significance of the building. It’s great that one of the cities best restaurants and interesting malt houses have combined the way they have. My Grandfather, born in Cape Girardeau and later lived in St. Louis – worked as a refrigeration engineer for the Schnaider Brewery in Guadalajara, Mexico (1920-25). Thank you for the sources you cited in your article. I will definitely look for both of these books to help me in my research. Next time I am in St. Louis I’ll have to visit the Malt House and toast with a beer for my old Grand-Dad. Very nice article! Do you happen to know if Joseph M. Schnaider, who was instrumental in establishing the Cerveceria Cuauhtémoc in Monteray, Mexico from 1887 to 1897 was related to this family? I read he was from St. Louis and a brewer, so I am guessing it may be. You are correct! It is the same Joseph Schnaider. GRAND SON IN MEXICO ? I am José A Rivero, Mr. Joseph Schnaider was my greatgrandfather, he was the founder together with others gent men’s of Cerveceria Cushtenoc in Monterrey Mexico. The One in the picture is Joseph M Schnaider the one that came to San Luis father of Joseph Schaider the one that came to Monterrey Mexico. Cameron, that was a most interesting story and very well written. I am writing to you because my daughter Debbie married a great great grandson of Joseph M Schnaider. His mother was Pati Schnaider and her mother was from a very respectable family in Mexico. In quite a coincidence Pati and her two brothers have been invited to a book signing publishing party in Monterey Mexico in two weeks time. Pati is not going but it seems that the brothers are because somebody had written a book about the Schnaider Family. My daughter and her husband were invited also but are too busy to go. I have forwarded your blog to her and she was extremely interested. We already knew something of the events in St Louis due ho a privately circulated book written in the late 18 hundreds but it had nothing like the detail in your piece. Thank you for writing it. I am now the old man that you were talking about, 82 and counting but as an English beer drinker myself I don’t fancy the cocktail that you were describing. On an odd note, my son-in-law has never had a beer in his life, although he does drink.